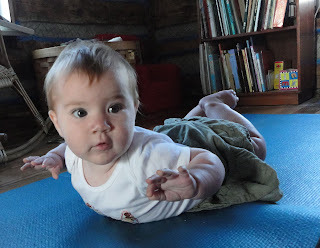 It's fascinating to watch babies as they learn to move. Here's a picture of the youngest yogi in the family, 7 month old Leila. She moves from her center, and outward from within. core with each movement. Soon she'll be crawling, then walking. and with time gravity will inevitably start to take its toll. her heart rather than being overwhelmed by others and the world. in all we do from our center, with ease and grace. What helps you to move from within?